Extra and Gary are the formal ones. They both rented a Tux for this photo. .
....Gary Meyer and Patric Hedlund with their friends, Oscar and Extra. Extra is the one with pointy ears. She is on-site supervisor at Dendrite Forest. ....Meyer also co-produced the widely acclaimed Cover-Up: Behind the Iran-Contra Affair. ....Together they produced the 48-part series on Computers, Freedom & Privacy, an examination of the future of the networked world (used by governments, universities and libraries from the U.S. Congress to the European Community). 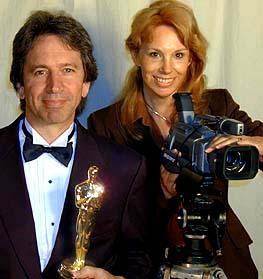 ....Hedlund's credits include projects for Discovery, A&E, Public Television, The History Channel, CNN, Fox Television, international syndication, print stories in national publications and the book A BREAD CRUMB TRAIL THROUGH THE PBS JUNGLE: The Producer's Survival Guide.The team has extensive experience with converging media, the internet and interactive television. All content on this site copyright 1994-2002 Dendrite Forest, Inc.